now i'm not incredibly familiar with what web server configuration he is running (although he is running netbeans/mongrel), but it got me thinking of 2 things. first, maybe he needed to add a mime mapping. simple enough, but if you move things around you might not have known where you need to change things. 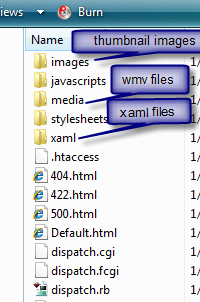 you may wonder why you don't have to change the MediaElement in the player.xaml file. well, if you are using an expression encoder template, the Url of that element is controlled by the StartPlayer.js mediaUrl attribute being passed to the player.